Who is Himalayan High Treks? Effie Fletcher is the founder and director of Himalayan High Treks. Effie maintains certification as a Wilderness First Responder and practices her first aid skills by volunteering as an instructor. Her area of expertise is altitude sickness and its avoidance. For many years Effie led backpacking trips for the Sierra Club including excursions to Hawaii and the Grand Canyon. She was a volunteer leader and instructor for the Sierra Club Snow Camping Training Series. Effie is a graduate of the National Outdoor Leadership School's course for Outdoor Educators. As a student of Business at San Francisco City College, Effie earned her Certificate in Small Business Management. She has led treks to Nepal, India, Pakistan, Bhutan and Tibet for nearly three decades. Effie founded Himalayan High Treks in 1988 as an alternative to larger companies. Her focus was the Himalayan region, where she has vast experience and has cultivated close relationships with many local communities. "It's important to find ways to give back to the local people and help them create means to earn a living without leaving their land", she affirms. Effie is a student of Tibetan Buddhism and has studied with Ven. Robina Courtin since 1989. She is the Coordinator of the Dharma Journeys Pilgrimage, and is a graduate of Goddard College in Vermont where she went to school with her husband Marc during the 1970s. They have one daughter, Tara, born in 2000. Marin Johannsson has led trips for Himalayan High Treks since 1990. She's not only trained in first-aid, maintaining a certification as a Wilderness first responder but she will keep you laughing up the steepest part of the hiking. She holds a B.S. in Recreation with an emphasis on Outdoor Leadership and has taught a variety of sports: rock climbing, snow camping, rafting and canoeing. When not climbing up mountains or traveling around the world, Marin enjoys Asian inspired art and leading local snowshoe hikes near her home in Truckee, California. With good humor, fine organizational skills and in coordination with our dedicated local staff she will ensure you have a great time on the trip. Amber Tamang is from a small village in the Solu Khumbu region of Nepal — a hamlet so small it's not on most maps! Amber began as a porter in 1992, to put himself though high school and college. For his undergraduate degree, he wrote his thesis on protection for workers in the tourism industry and received his Masters Degree in in Nepali Culture, Religion and Philosophy. He researches Himalayan culture and religion and has published articles in Nepali and English. He studies Buddhist Mani Walls — low stone walls inscribed with Om Mani Padme Hum, other Buddhist prayers and imagery. 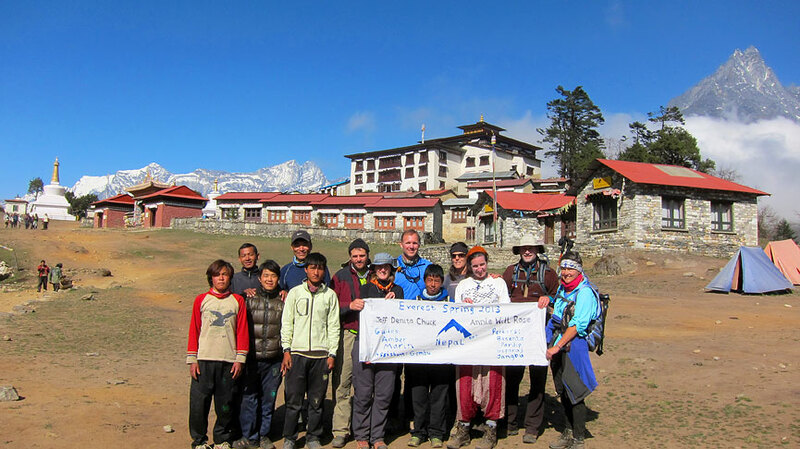 Amber began guiding with Himalayan High Treks in 1995, introducing trekkers to the wonders of Nepal, Tibet and India. He is now a group leader and Nepal Manager. Those who've traveled with him praise his patience, kindness and articulate English as he enthusiastically describes Himalayan mountain culture and Buddhist people. Amber, wife Sushma and daughter Anjali live in the Thamel district of Kathmandu. Priscilla McKenney made her first Nepal journey in 1987 and has studied both the Nepali language and Tibetan Buddhism. She leads HHT treks in the Everest region, Sikkim, Bhutan and Tibet. In addition to her love of the mountains, Priscilla has an affinity for the water. When moving to the San Francisco area to become Program Director for Girlventures, she packed her kayak on top of her truck and drove down to introduce herself to Bay Area waters. She is trained as an Emergency Medical Technician and maintains first aid certification as a Wilderness First Responder. She has a Bachelor of Science in Environmental Studies from Evergreen State College in Washington and a Masters Degree in Experiential Education from Prescott College in Arizona. Kalsang Bodh, better known as "K.G." is our Regional Manager for Northern India. His experience as an guide began as a horseman and packer for the Western Himalayan Mountaineering Institute in 1974. At the time, he owned about twenty small horses. Although his duties were packing gear for the climbing students, K.G. became fascinated and learned to climb. He has ascended technical peaks beyond 20,000 feet, including Stok Kangri (20,188 feet) near Leh. In 1978 he became involved in Western Himalayan Holidays, an English company. He was a horseman, cook and guide with them for a decade before joining Himalayan High Treks in 1989. K.G. guides and organizes our India treks in Dharamsala, Manali, Lahaul, Spiti, Ladakh and Zanskar. He owns over a dozen horses and built his house in the Kulu Valley where he lives with his wife, Paulo and family. Dorji Tsering is from a small village near Paro, Bhutan. 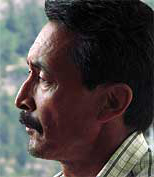 He completed the Guide Training Program from the Department of Tourism, Royal Government of Bhutan, in 1996. Dorji is our Senior Bhutan Guide and started with HHT in 1999. Over the years, he has led many spirited travelers on explorations through magical Bhutan. Bhim Pakhrin is from Nepal's rural Solu Khumbu region. After working as a Sherpa and an internship with Nepal's Tourism Ministry he joined HHT. Bhim lives with his wife and two children in the Kathmandu Valley. He has guided many people on treks in the Everest, Annapurna, Langtang, Helambu, Mustang, Simikot and Manaslu regions of Nepal. of this ancient and fascinating mountain region. Saila Tamang is from small Tapting village in Solu Khumbu. Saila started in trekking as a kitchen helper, a cook and finally joined HHT in 1999. He has completed guide, first aid and English courses and has become a popular and experienced guide for many of our remote trips. Doka coordinates logistics and ground support for our Tibet trips. She is so conscientious, Doka will personally check each Lhasa hotel room before clients even check in! Her flawless attention ensures that every HHT trip to Tibet becomes a lifelong memory... without a hitch! Prem, our head Cook, has fed hearty HHT trekkers since 2003. He is just one of HHT's cooks, working their trailside magic on our treks. Hungry group leaders and weary trekkers praise his wilderness cuisine. After a long day on the trail, Prem's kitchen tent is a welcome sight! cares for her daughter, Angeli. Tsering Lhamu is our ticketing and local operations expert in Delhi. She was born in Sikkim, attended Loreto College in Darjeeling and studied tourism at Delhi's Sita Academy. She has 12 years experience in tourism with Radisson Hotels and several tour agencies. Lhamu has traveled throughout India and specializes in Sikkim and the Buddhist Pilgrimage Areas including Dharamsala. Uttam, our horseman, is from Mandi, India and has faithfully supported our HHT treks since 1998. You'll find him carefully handling and caring for sturdy horses and pack animals along Northern India's rugged mountain trails. Throughout the year Uttam cares for the same team of 15–20 horses and ponies that haul our trekker's heavy loads along long, rugged and steep Himalayan trails. Karna B. Tamang "KB" is a very experienced and energetic climbing guide who also guides for trekking trips in Nepal as well as Tibet. As a marathon runner he has completed the Everest Marathon that runs along trails between Everest Base Camp at 18,000 feet and Namche Bazaar at 11,000 feet. In Spring of 2009 he first climbed Mount Everest. which is also located in Manali. Thupten is our main Sikkim guide and is very knowledgable about the culture, flora, fauna and the rugged trails of the remote Indian Himalaya. Trekkers tell us about meeting his many local contacts and his large extended family who live throughout the region. These encounters make trekking with him a unique and extraordinary experience.